HINT: The telling clue can be found in lead II but you'll have to use calipers and think "outside-the-box". 3 days after this ECG, the patient reverted back to sinus rhythm but continued to display this one finding. Good luck! Only click on these 2 links if you want the answer given to you. A-flutter with a 4:1 conduction rate. I'm not going to give away the answer just yet since no one else has identified it, but this is an absolutely awesome tracing Jason! Good eye for picking this up! Thank you for the compliment Vince. This is one of my favorite ECGs in my collection! Atrial Fib with a narrow QRS complex with constant R-R and frecuency of around 75bpm. I will consider hisian pacing, left pacing, or even stranger one atrium with a fib and the other (right) in sinus rhythm. Could there be a delta wave in beats 2 and 8 or is it just my imagination? I've just checked out the 'spoilers'. I would never have got this one! In all honesty . . . . In all honesty, I may not have recognized this either had I not reverse-engineered my interpretation. It was only after I looked at the patient's ECG showing sinus rhythm that I thought to go back and look at some of their other recent ECGs and that's when I saw what was happening here. (1.) Atrial flutter (rate about 300/min) with 4:1 A-V conduction reducing the ventricular rate to about 75/min (see laddergram). (2.) Incomplete right bundle-branch block. (3.) 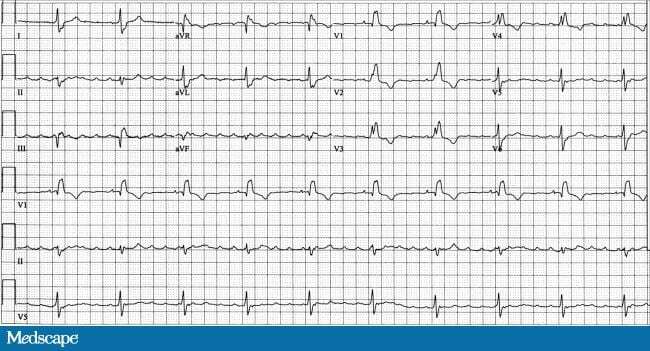 Sinus rhythm at a rate of about 87/min (best seen in lead II). Status-post orthotopic heart transplant. The donor heart is in atrial flutter (arrows in lead aVF) and the atrial cap of the recipient heart is in sinus rhythm. Note that the sinus P-waves can be seen marching through and deforming the sawtooth pattern of the flutter waves (arrows in lead II). In the laddergram, the sinoatrial (S-A) teir is meant to represent the S-A node of the recipient heart's atrial cap. As I previously mentioned, the patient's donor heart reverted back into sinus rhythm 3 days later. At that time the donor heart was in sinus rhythm at a rate of 83/min and the atrial cap of the recipient heart was in sinus rhythm at a comparable rate of 79/min. This same scenerio could be seen in a heart with dissociated atrial rhythms. The right atria in sinus rhythm and the left atria in atrial flutter.